The cottage has been completely renovated into a comfortable 2 bedroom guest house. The ground floor is open plan with comfortable seating, a sofa and two easy chairs, a dining area and fully equipped kitchen. The shower room and separate toilet are also on the ground floor. First floor masterbedroom with double boxspring bed (180x200). The second bedroom has open access with a climb over a wooden beam, two single comfortable boxspring beds( 90x200). Both bedrooms have ample storage space. The enclosed garden with lovely views has a terrace with a table, chairs, a parasol and two deck chairs. Gas barbecue. We have a swimming pool in our private garden, which during the summer months we share with our guests on appointment only. Clean sheets and towels, are provided once a week. Our cottage is NON SMOKING. It is NOT suitable for children under 12 years old and NO pets allowed. Our property sits on a hill covered by vineyards and overlooks an equestrian centre ( livery only, no riding school) the hamlet is rural and mostly quiet but occasionally you'll witness the hustle and bustle of the agricultural activities that surround us. You can walk to the Chateau de Couches but for most other attractions you will take the car. Both Couches and St.Leger sur Dheune offer all amenities at 5 minutes drive. The Voie Verte along the Canal du Centre offers walking, cycling and boating activities from St. Leger sur Dheune. Beaune, capital of wines, Chalon Sur Saone and Autun with its Roman origins are all within easy reach and offer some of the historical and cultural attractions the region possesses, plus a golf course each. Even nearer in Monchanin there is also an 18 hole golf course. Dijon, capital of the region and former seat of the Dukes of Burgundy is at an hours drive and also has good train connections from Chagny. Whether you love wining and dining, are interested in seeing or doing a lot or would just like to lounge in the shade this place offers it all!! We are Dutch, and moved to the area in 2000. We own an estate agency France4u, helping foreigners buy and settle in the Burgundy region since 2002. We like playing golf and love our animals, we ride horses and walk our lamas and dogs. We love meeting people from all over the world, and will see to it, that you have everything you need. We love the location as it has beautiful views on the Dheune valley to one side and is at the foot of the vineyards of the Cote Couchoise on the other. In between Couches and St. Leger sur Dheune it is very close to all amenities. The cottage we now rent out, we comfortably lived in whilst the main house was renovated. It is next to our main house and there is a large hedge that separates the two preserving privacy. Great view, private garden, cute setting and cosy house, honest quality materials, comfortable beds. Satellite TV and internet via WIFI included. Swimming is possible in a lake, 10 minutes from our home. We live in the main house, so if you need anything, you can ask immediately. Shops and facilities 5 minute drive away TGV Le Creusot is 20 minutes from our house ( for a day trip to Paris at 1 hour 10 min with the fast train, or Lyon at 35 min) On the edge of the Cote Couchois and very near to the famous Burgundy wine region the Cote D'Or. Beaune and its Hospices, not to be missed, Chalon sur Saone and former Roman capital Autun also at an easy distance. Wining and dining, walking, cycling, visiting chateaux, Voie Verte, ballooning, climbing experiences, Acroparc and many historic and cultural attractions, you can spend your time well in this area! Or maybe you would prefer just sitting in the garden, enjoying the views and a glass of wine? Shower room and separate toilet are on the ground floor. All towels are provided. The beds will be made up for you when you arrive, If you stay longer than a week, we will change the linen for you once a week. We provide two sets of towels per person per week. Please do not take them to a pool or lake, we have different towels for that, just ask and we will provide them. The open plan living has a comfy seating area with lovely view. It has a sofa and two easy chairs a small table and a tv. There are salt, pepper, oil, matches and some herbs provided. induction cooker, combined microwave and oven. The cottage sits in its enclosed garden. Access to the estate is through automated gates for which you will receive a remote control to use during your stay, the driveway is shared. At the little harbour in St. Leger sur Dheune you can rent a boat for a whole or a half day to navigate the Canal. Quite popular so reserving a must. A wonderful way of sight seeing! At Lac de Seton, at about 1 hr drive there are all kinds of watersports possible, waterski, jetski, water bike a beach along the lake and a little restaurant. Perfect for a summer's day on the water. There are three 18 holes golf courses within easy distance; Montchanin( 20 min) and Beaune ( Levernois) and Chalon sur Saone at half an hour. Autun has a beautiful 12 hole course. The swimming pool is in the owners private garden. During the summer season guests may share the pool on appointment with the owners only . Fantastic location with a beautiful view and great hospitality! Highly recommended! This beautiful cottage is well equipped and furnished very tastefully. All we needed was there and the owners made us feeling home. The area is beautiful and surrounded by vineyards. From the cottage it’s easy access to the rest of Burgundy and the famous wineries and beautiful Beane are close by. We will absolutely go back to this marvellous place! Beautifully decorated, charming and comfortable! What more could you ask for? Benjamin and Frances are wonderful hosts. They make sure you feel welcome and have a very helpful binder in the cottage with good restaurant recommendations, local markets to visit and highlights of nearby attractions. Surprised us with croissants and bread Sunday morning from an excellent bakery, which we visited everyday thereafter. Also provided a lovely chilled bottle of bubbly rose from a nearby domaine. You are about a 30 minute drive to Beaune, but close to the smaller towns of Saint-Léger-sur-Dheune and Couches for supermarkets or bakeries. Would love to visit again someday! We are very pleased you enjoyed your stay, thank you for the lovely review! You are more than welcome to return of course, we hope the rest of your trip was as pleasant and you had a safe journey! Thanks you for staying with us and au revoir! Schon der Empfang in Les Vezeaux war sehr herzlich. Nach Bezug unseres Ferien- hauses fühlten wir uns gleich sehr wohl, wofür unter anderem die geschmackvolle Einrichtung, die schöne Lage und der eigene Garten mit Tisch und 4 Stühlen verantwortlich waren. Sehr gut geschlafen haben wir durch die guten Betten und die nächtliche Ruhe. Tagsüber lud das schöne Wetter zu Ausflügen in die Umgebung ein. So haben wir mehrere Städte besucht, unter anderem die Burg Rochepot und die Schlösser Cormatin und Sully besichtigt und waren sehr beeindruckt. Aber auch zum Sonnen- baden stehen im Garten von Mont du lievre 2 Sonnenliegen zur Verfügung. Schön waren auch Abendessen und Frühstück im Garten (bei entsprechendem Wetter). Ansonsten ist es auch sehr angenehm, im Wohn/Esszimmer am Tisch zu sitzen! Durch die sinnvolle Aufteilung: oben 2 Schlafzimmer, unten Wohn/Esszimmer mit Küchenzeile sowie 1 Bad mit separater Toilette lassen sich auch "Schlechtwettertage" im Ferienhaus sehr gut verbringen. Und durch die umfangreiche Geschirr- Gläser- und Küchenausstattung ist für alles gesorgt. Aber auch SAT-Fernseher und CD-Player sind vorhanden. Besonders angenehm war die Hilfsbereitschaft und das große Engagement der Gastgeber, ihren Gästen eine Super-Unterbringung zu bieten. So hatten wir im August 2018 1 Woche unvergesslicher Ferien in Mont du lievre! Nochmals vielen Dank an Familie Haas - wir werden sicher wiederkommen. The house was exactly as pictured -- well-equipped, clean and spacious, and nicely-decorated. The two bedrooms upstairs were very nice. The kitchen had everything needed to make simple meals, and the views from the windows and garden were lovely. 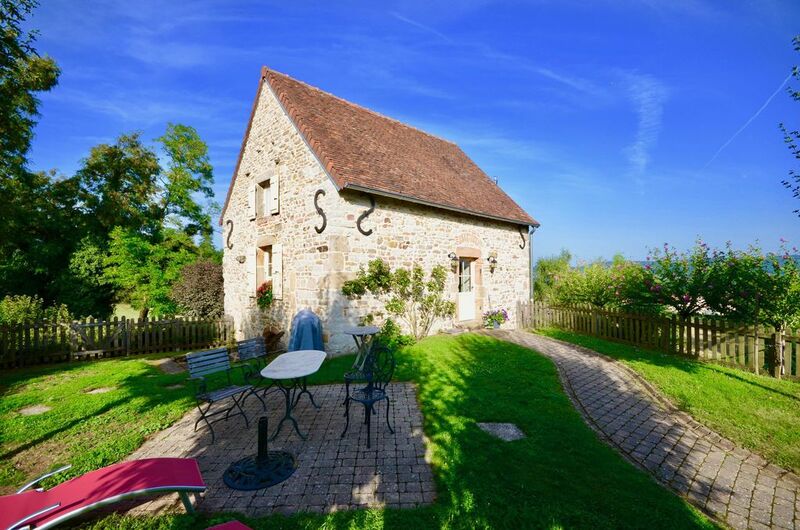 This cottage is located in a very small village, but only a short drive from larger towns, stores and restaurants, and all the wineries and sites of Burgundy. The only minor downside was that the bathroom was located on the first floor (going down the stairs at night) and getting into the 2nd bedroom by climbing over a ledge onto a stool, was a bit inconvenient. But overall a charming, spacious and lovely place for a Burgundian sojourn. Unbelievable property, cottage and setting! The Haas Family that owns this cottage are the most amazing people I have ever met! The cottage was spotless! The location is a cyclist's paradise! They are minutes from the famous Voie Verte cycling paths which is a dedicated bike path with hundreds of kilometers of riding where no cars are allowed. The cottage has a ton of amenities. The property is located on a hill overlooking the entire valley below. It was one of the best trips of my life! I would highly recommend that you look no further if you are wanting to stay in Burgundy! This cottage has it all. Dear Tom, it was a pleasure having you with us. Thank you very much for this great review... can you see our cheeks blushing? Very clean and beautiful cottage located in a perfect location in Burgundy!! Benjamin and Francis Haas are amazing! They are both very kind and helpful. The cottage was immaculate. They have a beautiful property located in a perfect location. It’s only a 5-10 minute bike ride to the famous Voir Verte bike path. The Voir Verte stretches for hundreds of miles and no cars are allowed so it’s very relaxing. The cottage has a garden area with a patio and it’s very relaxing. If you are looking to unwind and relax in a gorgeous countryside location look no further. This is as good as it gets! The main attraction in this regions is of course Wine! Lots to visit and taste! Many of the large wine houses can be visited, for example Pommard (red) and Meusault (white). In most villages you will find a cellar to visit, or see the wine farmers about their daily chores in the fields. At the house are introductions to our neighbours, Mrs Berbezy for red, and Bernard Royet for whites and wonderful Cremants ( the local champagne). With wine goes food so the region boasts many restaurants, from 3 star Michelin like Lameloise in Chagny, to the little places that offer the locals their daily 3 course lunch for 11 euros. In St. Leger you will also find a pizzeria, a kebab shop and a restaurant that offers a lunch menu and evening a la carte dishes. You can visit a market every day of the week. We specially like the cosy Beaune Saturday morning and Chalon sur Saone on Sunday morning. Unique is the early Monday morning market in Louhans, where there is livestock and the famous Bresse chicken. At less than 30km from us there are 4 golf courses: Montchanin 18 holes, Levernois (near Beaune) 18 holes, Chalon 18 holes and Autun 12 holes. We have lamas at the house, we can organize a walk with them. Also for children there are several activities such as Acroparc in Givry at 20 min drive, a secure adventure parc with climbs through the trees from easy to difficult and good supervision: swing from tree top to tree top. There are pools and a small sailing lake at Autun, and the summer slide, steam train and carting at le Creusot. At an hours drive at Lac de Seton there are jet skis and water bikes for rent, a lovely day out when it is hot! The voie Verte along the Canal du Centre is right nearby in St.Leger sur Dheune. You can walk, rollerblade or cycle along the Canal on 80 km of paved road. At the harbour of St. Leger you can rent a boat or bicycles for a stroll along the canal. At walking distance is historic Couches castle that organises kids activities too, making it a must see place for young and old. If you wish you can book a wine tasting after the visit. The Hospices are a must see in Beaune, and a trip along the castles towards Cormatin and Tournus with lunch on the way makes a lovely day too. Architecture galore at Cluny, and the region is the base of Romanesque architecture. A bit further out the beautiful abbey of Fontenay, and picturesque Semur en Auxois. For a city trip Dijon is not to be missed.